The Police said they have arrested a five-man gang of fake journalists that usually gate-crashed into important events with the mission to steal expensive phones and money. One of the gang members, Musa Auwalu, 43 years old, from Nasarawa LGA of Kano, has built a mansion, from the proceeds of the crime, the police said in a statement issued by CSP Jimoh Moshood today. The Police described him as the gang leader, adding that he was able to build the mansion from some foreign currencies stolen from an unidentified VIP at a wedding in Abuja last year. The other gang members are Kolawole Akinbode, 50 years old, from Ogun Central LGA of Ogun state, Umar Tahir Abba, 53 years old from Mubi of Adamawa state. The others are 55 year-old Abdulahi Muhammed from Gudunfulani, LGA of Bauchi state and 60 year-old Muhammad sale from Ngogo, LGA of Kano state. All the fake journalists are all men. The Police said they recovered from the men thirteen expensive phones, fake Journalist ID Cards from non existing media houses. “The gang leader has built a house in Kano from the huge foreign currencies he stole during a wedding of a Very Important Personality last year in Abuja. “The Inspector General of Police’s Intelligence Response Team trailed and arrested the above mentioned suspects after complaints of stolen phones from important personalities who attended a prominent wedding in Abeokuta, Ogun State on the 8th July, 2017. 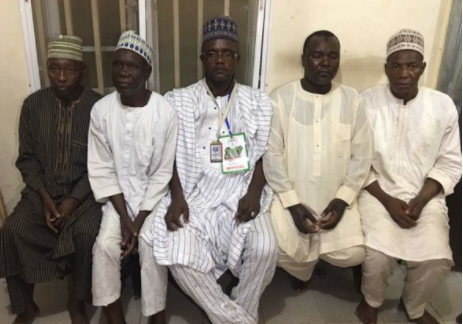 “They were arrested in different states of the Federation namely: Ogun, Edo, Abuja and Kano States. The exhibits listed above were recovered from them. The house built in Kano State from the huge foreign currencies the gang leader stole during a wedding of a Very Important Personality last year in Abuja has been identified. “The suspects confessed to the crime and admitted to the various criminal roles they played in the commission of the offence. “The suspects confessed further that they specialise in impersonating journalists in order to gain access into venues of VIPs events/occasions to steal Handsets, Money and defraud high profile persons and unsuspecting members of the public at the venues of events in major cities in the country. “Investigation is being intensified to arrest other suspects at large. All suspects will be arraigned in court on completion of investigation”, the police said. The post Fake journalist builds mansion in Kano: Police appeared first on Vanguard News.